HOW TO BECOME A FAMOUS WRITER BEFORE YOU’RE DEAD by Ariel Gore (2007 Three Rivers/Random House) I couldn’t resist. Here’s what she says: Cover letters often get lost, and I’ve still got a great story sitting here next to my desk with no clue as to who wrote it, so include your contact info, but don’t include the little copyright symbol. It says to an editor: “I think this story is so good and I think you’re so evil that you’re going to steal it from me and not give me the million bucks it’s worth.” And that’s not a very nice how-do-you-do, is it? If you’re paranoid that some editor is going to steal your story, that’s fine, but be privately paranoid. you can stick a copy of your story in a manila envelope, mail it to yourself, and leave it unopened. If you’re more paranoid still, send a copy to the Library of Congress. But leave the little copyright symbol off your submission. This is excellent advice. Every time I see that little @ sign after an author’s name I recall editors at conferences saying they think amateur. Don’t miss Ariel Gore’s book. She has chapters called Giving Yourself a Lit Star Makeover, Master Your Craft, Publish Before You’re Ready, Play with the Big Dogs, and Become a Brazen Self-Promoter. We’ve been awakened in the wee hours of the morning by the scritchings in our walls that tells us we’re not the only ones living under this roof. As I have fed birds in our front yard for years, I’ve kept the bird seed in the garage with no problem until last week. Yes. Bird seed scattered everywhere. My husband, Mr. Duct Tape, used his usual solution. I warned him the silver stuff over cardboard would hardly stop the huge rodents we had wandering through our walls and garage. But at the moment, neither of us had time or supplies for anything more. Sure enough, the next day we had another clean-up. “We need to get a metal garbage can,” I said. Years ago we used to keep the dog food out there in a plastic can, but the rats ate a huge hole right through it. 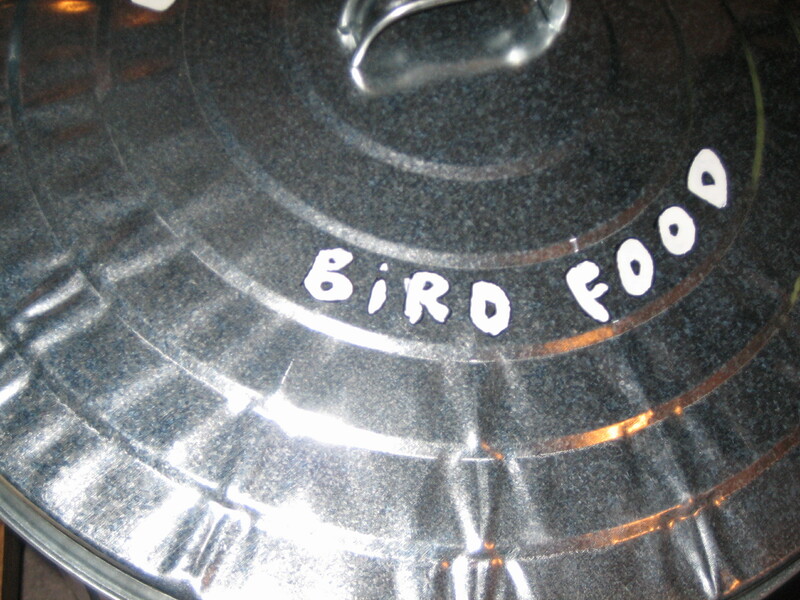 I saw his point, but I wasn’t thrilled about moving the bird seed into the living room either. And no way would I give up my beloved hobby. We were at a stand still and the rats were winning. Later in the day, I had to visit the jewelry store with a broken clasp on one of my cheap thrift store finds. An older silver-haired gent with a voice that surely came from a radio or t.v. station, stood leaning over the counter. “What I love about buying jewelry for her, is these fancy boxes,” he said, the necklace in front of him glittering so much I needed my sunglasses. Wow. I could hardly take my eyes off of him. Silver hair. Tan. Fit in his tennis outfit. Gorgeous. Seventy? Perhaps older, but he would have been a hunk when he was younger. Who was he buying the beautiful diamond necklace for? I could picture her. She’d be a younger woman, also very slim and tan. “Hey, I gotta move my car, ” he said. “I don’t want to have any scratches on it from car doors opening. I’ll be right back.” He ran out the door. The hoots calmed down in the store by the time the gent came back in the store to take his jewels to his lady-friend. He told me he’d call my husband to give him some advice, but I declined his offer, smiling. I didn’t want any bling. 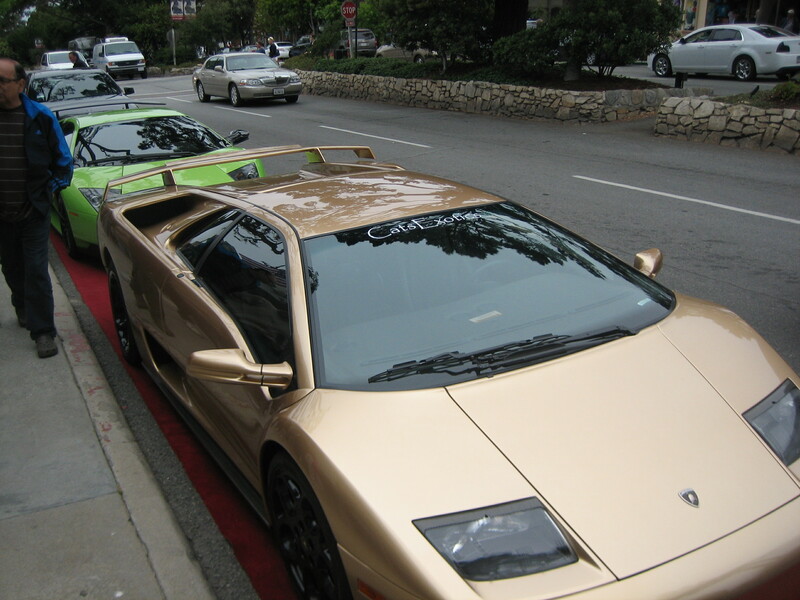 This guy had an expensive sports car. You just know it. Mr. $. I’m happy if I get a shiny garbage can. And today I’m thrilled. Why? Neither of us got much sleep last night. The rats were at it again. More garage-cleaning this morning. I looked at my husband and raised an eyebrow. “I’ll get it,” said my husband. Can’t wait to tell the ladies at the jewelry store. 1. People watch. Imagine the story behind the story of various people you see on the street. Who are they? What are their back stories? Who are their mates? Do they have children? 2. Use a person that you see during your wanderings as a focus for a story, poem or personal narrative/essay. 3. Take a paper and pen to a coffee shop or other public place. Glance up now and then without staring. That way people won’t know you are writing about them. Describe a person, animal or object you see physically. Then imagine their emotional life. Next, throw them into a story. What is their problem? Their goal? Who is their antagonist? Classes range from how to write a nonfiction book proposal, essay writing, op ed, writing for television, novels, short stories, memoirs, picture books and more. Check them out, sign up and be prepared to write! If anyone has any other good online writing workshop experience, let me know and I’ll post your suggestions here. The other day at the gas station, the middle-aged man filling up ahead of me had earrings hanging from every available space on both ear lobes. When he returned the nozzle with a click, I could see silver bling glittering from his eyebrows and nose too. His clothes were unremarkable. Polo shirt and shorts. As he got into his compact car, I glanced at his bumper stickers. LISTEN TO CATHOLIC RADIO, followed by call letters. Another religious sticker emblazoned the other side of his bumper. 1. How is the character you are writing about NOT a stereotype? Write a scene showing one side of your character and follow it up with something unusual or quirky. 2. Look for possible stereotypes within your manuscripts. How can you change this? My cousin Mary, in Wisconsin, sends me the most delightful postcards. They are worthy of The Postcard Hall of Fame. A few weeks ago, she attended a German Fest and the card was filled with dashing dachshunds . . . one in a hilarious costume. Yesterday I received one from the Wisconsin State Fair. Alice In Dairyland, with a milk mustache of course, holds a glass of milk and stands in front of serene cows in a pasture. The sign below her? OUTSTANDING IN HER FIELD: 63rd Alice in Dairyland: Christine Linder. Paula, my Fresno friend, collects quirky postcards. You’ll have to wait a bit for this one, Paula, as it’s too cute to give up immediately. So what do postcards have to do with writing? Plenty! They teach you to write tight. You have to say what you mean in a few short words. Have you ever read old postcards? Delightful! Some are so well-written you can get a wonderful sense of the time, place and character of the person writing. Others are so general they are less helpful. 1. Design a postcard from a character in the project you are working on. Write it carefully. Who is she/he sending it to? Why? Where is it from? Where is it going to? 2. Design a postcard advertising your new book. Publicity is important in the publishing process and learning to write this is a whole different genre. 3. Write a “Dear John” postcard from a character breaking up with another character. Make it funny! 4. Write a postcard from one famous person to another famous person. 5. Which character in literature do you love? Send a postcard from him or her to another character in that book. 6. Write a postcards from different time periods in history. Make sure you are able to show time, place and character in the space the postcard allows. This weekend we spent time in Monterey with friends. Wandering the streets of Carmel, vintage cars of all makes, years, and varieties dotted the streets like colorful signs of years gone past. Who knows what this car is? We have no idea. But it’s sleek! 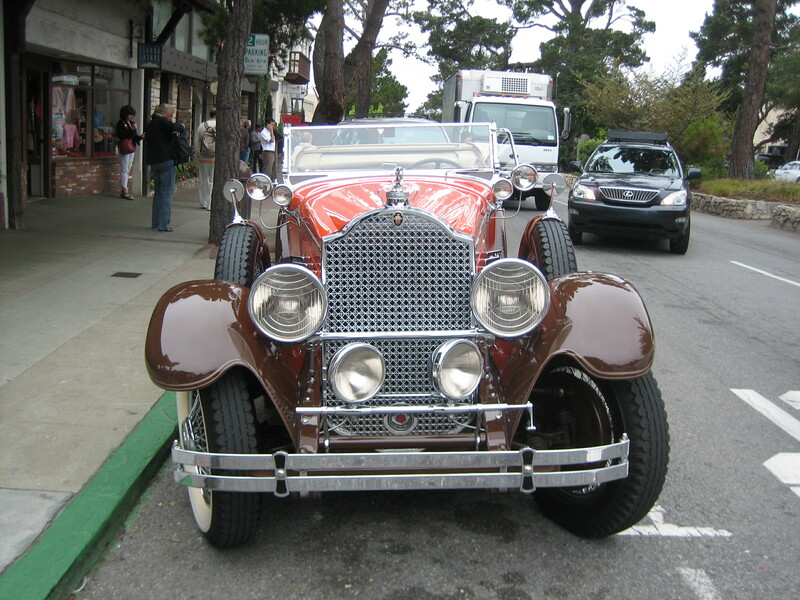 But the most fascinating part of the informal car “show” on the streets of Carmel, were some of the people who were attracted to the, um cars. (emphasis on um) While a friend of mine stared at a lovely Rolls Royce, I noted a tall, thin blonde busy taking photos with a professional looking camera. “Look, Hilde!” I poked my friend and nodded toward the woman. As Hilde and I watched, the perky blonde held a more captive audience than the actual car. In four-inch spiked heels, skinny jeans and a sparkly jacket, her long, straight hair swayed with her hips as she bent this way and that, leaned in for the best pictures possible. “Do you think there is actually film in her camera?” I said to Hilde. “She certainly is performing, isn’t she?” Hilde commented. It was pure art. I had to admire her theatrical abilities. She captured the stage well. We moved on, and a few cars later we noticed another gal – – a copycat. Only this model-like blonde wore a short-short colorful sundress, as she sashayed this way and that. On this overcast, cool day, I was bundled up in pants, sweater and a coat. I felt sorry for the poor little thing. But she seemed to tolerate the weather well. Perhaps with all of her movement and energy, she hardly felt the cold. And I’m sure she’d be warm soon enough . . . There were plenty of stories here this day. And characters leading us to them. 1. Write a story about one of these blondes. Who is she? What happens to her? Who does she meet? Perhaps the blondes find conflict with each other. Maybe they are already friends and in cohoots? 2. Write a story about one of the cars. What is its history? Who owns it? What is the owner’s story? 3. Plop one of your own characters into this setting. What happens? What book would you use to swat a fly? I read a few pages more, and yes, the author continued to give information the characters already knew in dialogue rather than in narration. Of course I didn’t read it. Which classic have you never read –but pretended you did? As a children’s author, you’d think I’d have read all of the children’s classics. In college, I played a role of the queen in a take-off in Alice-in-Wonderland. I double-majored in education and children’s theater. OF COURSE everyone in the child drama center knew that book by heart. Everyone but ONE PERSON. Uh-hem. Try as I might, I couldn’t get through that book. Of course, a little background information of the time and place when the author wrote it may have helped me but that never happened. Tell us what your favorite childhood books were. Charlotte’s Web by E.B. White, The Borrowers by Mary Norton, The Little House in the Big Woods series by Laura Ignalls Wilder, and The All-of-A-Kind-Family series by Sydney Taylor. Are there books you’ve gone back to and read over and over again? Diary of a Young Girl by Anne Frank. Is there a book that scared the pants off of you? If there had been I would have closed it so fast . . . I wouldn’t have read it. Seriously, although I love good suspense stories, they don’t seem to “stay” in my mind as other books do. Is there a book you always meant to pick up but never did? I never read Gone with the Wind. I asked my mom to give it to me for Christmas one year as an adult and she did. And yet, it still sits on my shelf unread. I’m not sure why. Perhaps because I’ve already seen the movie and I know how it ends? What do you want to read next? I have a book by Carson McCuller’s The Member of the Wedding on request at the library. It was suggested by a friend. I love adult books where the main character is a child. Another friend told me I have GOT to read the children’s books Heart of a Shepherd by Rosanne Perry and Chicken Boy by Frances O’Roark Dowell. I read her fabulous book Falling In so now I’m hooked on her! I’ve read children’s books all of my life. So it’s affirming that the tide is turning and grownups are reading young adult books because they enjoy them. Although I do resent the line in the following New York Times article saying these books are easier to read and take less thinking than adult books. Both adult books and children’s books have their share of fabulous reads and lousy ones. You can’t lump them all together. As for a few good examples of young adult books with depth, read Holes by Louis Sachar. The Giver by Lois Lowry. Speak by Laurie Halse Anderson. And my favorite, written by a teenager herself . . . A Diary of a Young Girl by Anne Frank.